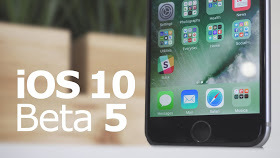 Apple recently launched its new version of iOS which is the iOS 10 beta 5 to everyone including the developers. The new update packs some exciting features of tweaks to the control, widgets windows, new Lock screen sound and more other features. The update is said to be coming via OTA and it will only be available to those who installed the first four betas or the beta configuration profile. •In-App purchases in the App Store. •iOS' interaction with Apple TV. •iPhone 6S panicking when using its Smart Battery Case. •Photo app doing a new scan on launch due to its AI and facial recognition data being reset. •Music Control center tweaked (how? Wait and see for yourself). •Today now includes two new view tabs: Data and Day. •Widgets now have darker backgrounds. •Lock sound changed and more. You will need to enroll yourself in the Apple developer program before you will be provided with a direct link to download the update. Kindly enroll yourself Here. Kindly ignore if you have already enrolled yourself cos you will be getting the update via push notification.